I was taking a car trip a few weeks ago, driving from the village where I live in the French Alps to Aix-en-Provence and back, about a 6-hour drive round-trip. As always, I brought my 160GB iPod classic along for company. While rolling down the autoroute, I started thinking of road trips I had taken with friends, back when I was younger, in the late 70s. We never traveled very far—maybe an hour or two to go to the beach, a concert, or a party—but we always had music to accompany us. Back then, it was cassettes or 8-track tapes: I especially remember Jon’s Mercury Marquis, which had an 8-track player and a shoebox of tapes in the back seat. (“Baby you were born to ka-chunk run.”) That was a gold-mine of music; maybe 10 hours worth to choose from. Later, other friends would keep little attache-case cassette carriers in their cars, stocked with dozens of Grateful Dead concerts or home-made mixtapes. Today’s choices are almost limitless compared to those days. I can easily match my iTunes library against the record library of my friend Stu, who worked in a record store (think of Rob Gordon, the character played by John Cusack in the movie High Fidelity). What stands out most, however, is the amount of space the music takes up. Back in the day of the LP—those round things that came before CDs—music took up a lot of space, and portability was especially limited. While you could have a big music collection—like Stu’s 3,000 LPs—it would cover an entire wall of your apartment more than a foot deep. And you had to come up with a system to classify your records. There was no search box to help you find a specific song among a thousand or more LPs; good memory was the only way to find something. So we’ve gone from limited portability (starting with portable record players that played singles and going through portable tape players) to total portability as music has changed from an analog to a fully digital commodity. We’ve gone from the ability to carry a handful of tapes to the entire recorded output of an artist. What’s next? Today we carry music on our portable devices, but when you think about it, this makes no sense. Why should we have to worry about the capacity of our music player; why should we have to come up with strategies for syncing only part of our large music libraries? Why shouldn’t we have access to all the music we want? Tomorrow’s way of listening to music will likely be different. We’ve recently taken our first steps toward keeping data in a “cloud”, remote servers accessible from any device, with services such as Apple’s MobileMe and Google Docs. Why can’t we do this with music? Either with our own music—imagine a way of sharing your iTunes library so your portable device can stream music from it anywhere—or a central server via a subscription service. 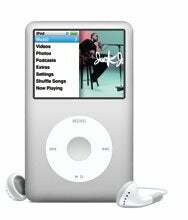 No longer will we have to worry about which music we carry with us, and iPods will be little more than receivers with screens that tap into wireless networks. As Chris Breen has written, Apple could easily set up a system so we could have a subscription to all the content of the iTunes Store to listen to at home. It’s a logical next step to make all this music available via portable devices that tap into the cloud. The way we listen to music changed when, after decades of coming from needles in grooves, it went digital. Now that digital music is mature, the next step is to disembody it entirely and stick it on central servers somewhere. No more will we need to worry about what to put on our iPods; someday soon, we’ll have an unlimited choice of music—for a monthly fee—wherever and whenever we want it.